Want your Boston Terrier to go be in style? Get them some stunning Boston Terrier dog dresses or dog suits. Your Boston Terrier will be thrilled to wear these stylish Boston Terrier dog clothes. 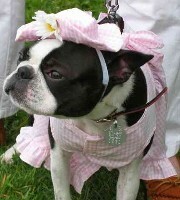 We carry of a nice collection of Boston Terrier dog dresses for your girl to make her the hit of the party. We even have a few Boston Terrier suits for your boy that will give him the attention he desires. These dog outfits are great for the holidays or any time you want to show your best friend off. 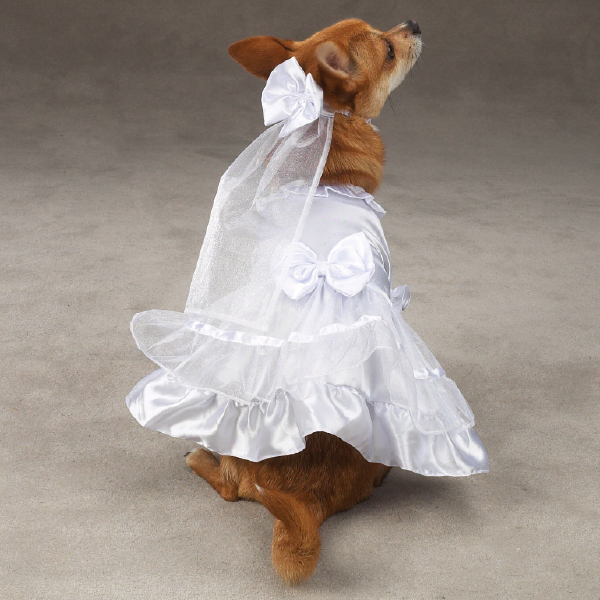 Click on the pictures below to see a full page to see a larger version of each dog dress. Remember hot rods and pony tails? That's the 50's! This doggie dress will bring your Boston back to those "Happy Days!" Made of 100% cotton pink fabric with black polka dots and petticoat of contrasting black. Collar is the reverse of the dress (black fabric with pink polka dots). Scarf and headgear not included. Dress closes in front with hook-and-loop fasteners. This adorable creation will spotlight your baby wherever you take her! Lightweight 100% cotton unlined dress in hot pink with white ruffle around the skirt and white sashes that wrap around the pet and tie in a bow on their back. The dress also has hook and loop closure at the neckline. Whether for the holidays, or just a dressed up occasion, this velvet dress will make your Boston look stunning! An elegant dress made of plush deep hunter green velvet lined in poly/cotton & trimmed in white faux fur & a white faux fur collar. Dry Clean only! Attaches in front with hook-&-loop closures. There won't be a single party that your pet won't be the best-dressed lady therein this beautiful Christmas Party Time Dog Dress! Originally introduced for Christmas, it has been brought back by popular demand for year-round wear. Beautiful red plaid taffeta dress with red and green tulle petticoats, and a green velvet collar. Closes at the neck with hook and loop fasteners. **When checking out please give us the length from your dog's neck to tail & the measurement around their neck so we can send the proper size dog dress in the special order instructions block. Felt Formal Top Hat that includes an adjustable strap that secures under pet's neck. Perfect for you male boston Terrier to wear to formal occasions.